Hey Scrappy Friends! I wanted to share with you how the Embellie Gellie saved our Father’s Day. I make my own enamel dots and received on order for over 1,000 the Saturday of Father’s Day. I needed have them shipped Monday, and I didn’t have all the colors on hand. I went ahead and made a ton of colors, but they still needed to be packed. Normally I do this all by hand and it takes me forever. With my Embellie Gellie though I was able to go in and pick up just the colors I was looking to pack. I was able to pack my whole order while still spending time at the park with my family and having a cook out with my Father. What could have taken hours and hours with Embellie Gellie took no time at all. Thanks for saving my Father’s Day! Hi Scrappy Friends! 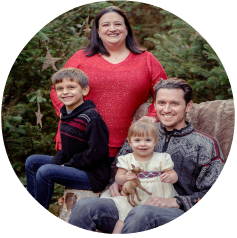 I’m back with something a bit different for my blog…a 9×12 layout. I saw this on Inkie Quill’s channel and figured I’ve give it a try for some variety. I really ended up loving it. For single 4×6 photos it was so much easier to not have as much white space to fill, and I think the layout looks more balanced. It won’t be something I completely change to, but I will definitely be incorporating some into my albums. 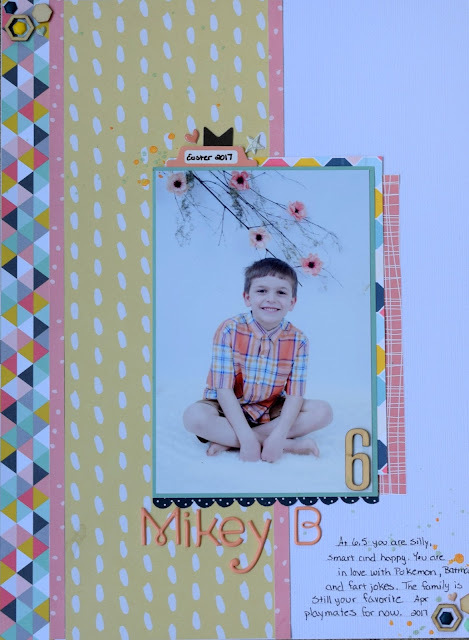 The other thing that’s different about this layout, at least for my blog is that the photo is my boy, but the supplies are meant for a girl. I used the Felicity Jane Caroline kit from April as the colors were perfect for the photo. To make this more masculine I pulled in the blue/navy and grey elements to balance out the pink. For me yellow is gender neutral so that worked week also. I then pulled in some wood elements for another masculine touch. Some mustard and seafoam Heidi Swapp Color Shine and I called it a day. I also wanted to share with you the glue I used to attach my wood elements…The Best Glue Ever. I used my Embellie Gellie to pick them up, but look at how little glue I had to use. I also will be entering this layout into the challenge at Scrap The Boys. Hey Scrappy Friends! I’m here today with a new to me product that I wanted to share with you because it’s changing the way I craft. 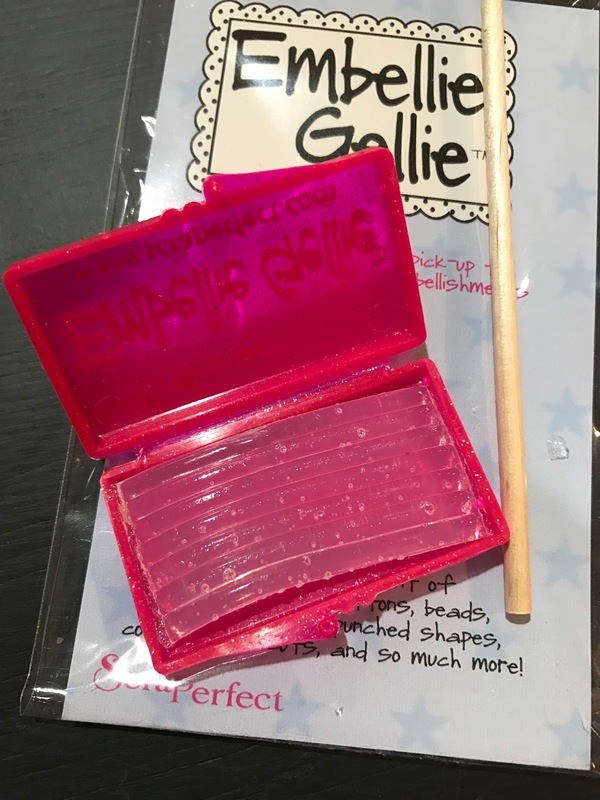 It’s the Embellie Gellie by ScraPerfect. Previously I was using the following pick up stick produced by another company. The problem with the above is see the green stuff…it only stays sticky for about three embellishments and then you have to pull it off and advance more. I mean seriously…who only put three sequins or gem type things on a layout. I was advancing sometimes three times each layout. Enter the Embellie Gellie. It comes with a wooden wand and the tacky portion in a small re-sealable container. Since you only use a small portion at a time I chose to score mine with my Tim Holtz craft knife so that I knew they were relatively proportional. Pull off the portion you scored and roll it around the flat end of the wooden wand. You can mold it to the shape you need for your embellishment. For a smaller one I used a point and a larger just a more round end. You’re now ready to start attaching embellishments. Touch the wand to the embellishment and you’re ready to go. So much easier to perfectly place than using your fingers or having the item pop away from you when using tweezers. You can always pick up multiple embellishments to transfer to your project. I tried picking up both the flat and rounded side of these homemade enamel dots to test and it worked on both sides. You can these use the pointed end of the wand to do any minor adjustments or push the embellishment further in your dot of adhesive. Game changer my friends…let me tell you. I then pop my tacky portion back in the box and it’s ready to use again the next time I craft. How easy is that and less expensive than buy the other product over and over since it runs out so quickly.